I was making a crochet doily pillow for my booth and thought I would share how I make them. Pillows have always been a big seller in my booth and one of my favorite things to make. The sky is the limit on creativity! 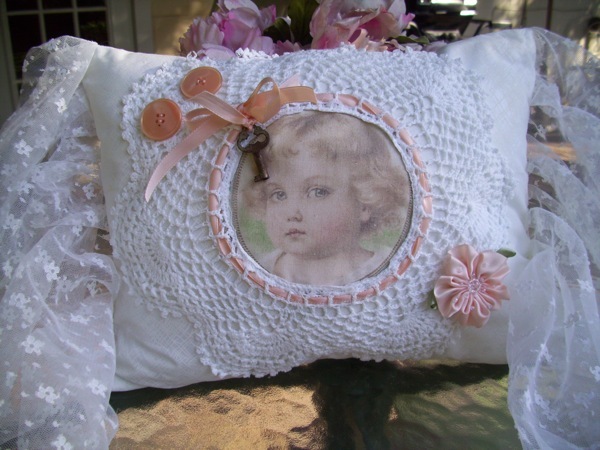 I will walk you through making this little french pillow. Now, this is how I do it, I figured it out through trial and error. I am sure there is many other ways. 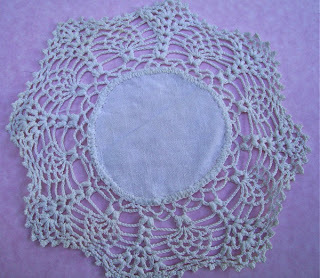 I start with a plain vintage doily, never throw them out if they have a stain or a hole! Just throw them my way!!! 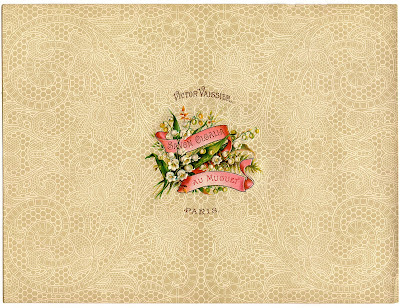 Now, center your doily over the fabric image. Now, there are a few ways to center it. 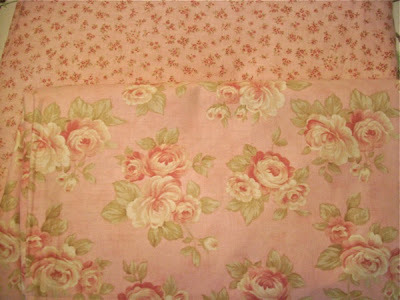 Some images are easy to see though the fabric and you can just center it. You could hold it up to the light. 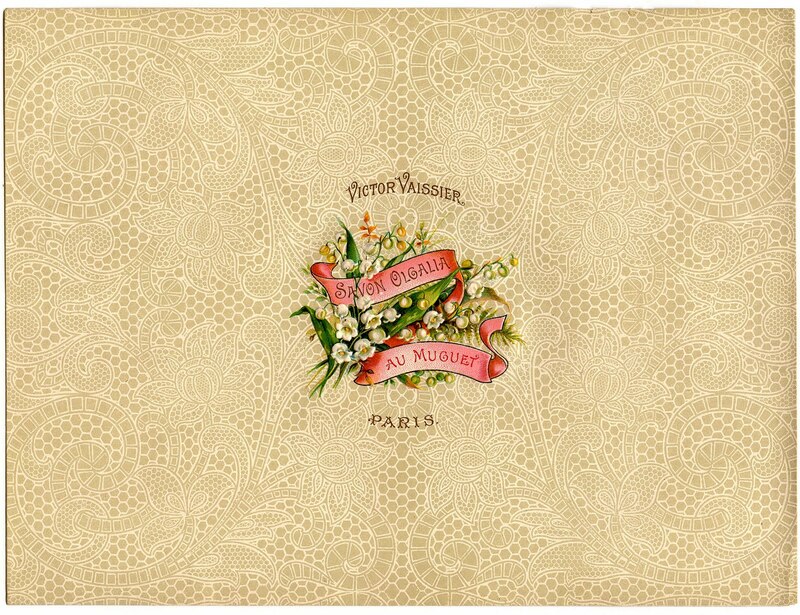 You could put a pin in the center of the doily and match it to the center of your image. I put mine over a flash light because the image was so light and I wanted to get the lettering centered. 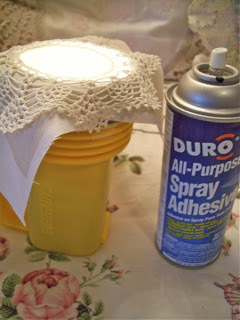 Now, give the center of your doily a light spray of adhesive. Be sure not to spray the crochet edge as it will gum up your needle.........Hum, wonder how I know this? Sew right along the edge, on the crochet, as close as you can get without sewing into the fabric..
You know those awards they give for blog photography....I'm not getting one! 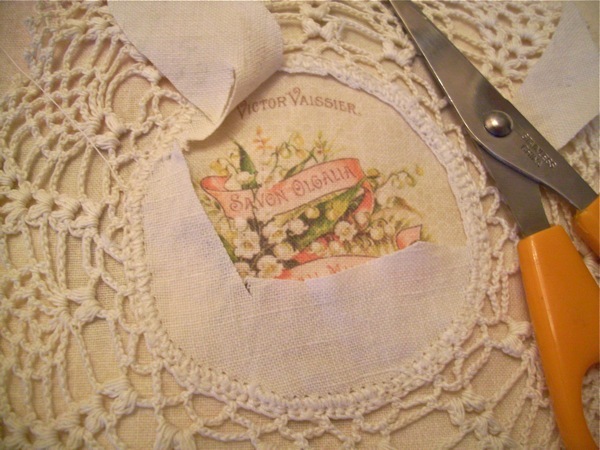 Now, carefully cut away the doily center as close as you can get without cutting into the crochet. Here you have it, now lets put it on the pillow. I found my heavy tan linen fabric, actually a shower curtain, at Ikea. It was in the discount area for $1.50 because the hem was out, oh we love a deal! 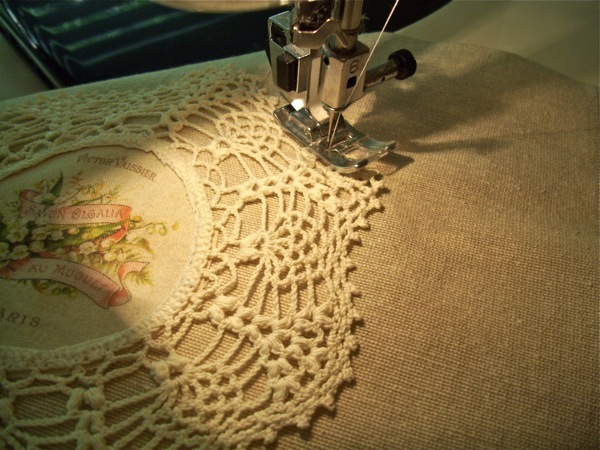 Once again put a little temporary adhesive in the center of the doily then lay it on your pillow fabric and set your machine to a baste stitch. 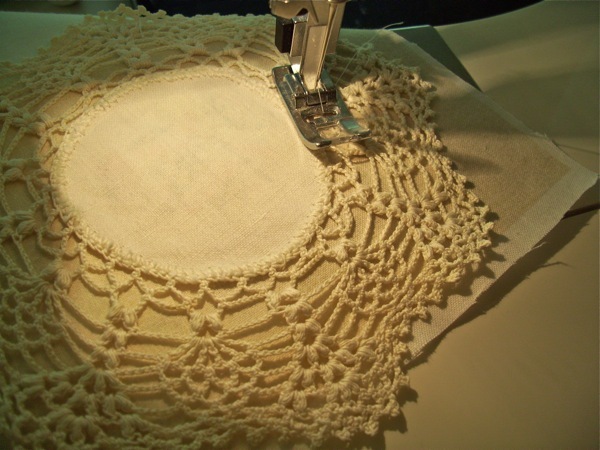 Sew the outside of the doily. You may have to occasionally leave the needle down and raise the presser foot as you sew, as it tends to bunch up. So there you have it! I added vintage crochet down each side. If you follow my blog you have figured out, all of my secrets are out of the closet, The Polka Dot Closet that is! ooh, yummy! I love that little girl one! You are sooo multi-talented! ..and your pictures are always great! You get so much done! I'm always looking for more creative time and never seem to find enough! Oh Thank You! I've been hoping to give this a try....haven't had the courage yet, but now I think I'll have to give it a try! 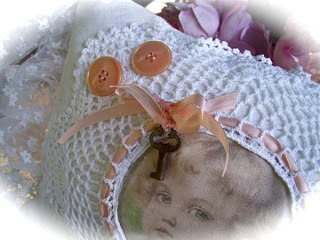 Love your blog...I'm a happy follower, and LOVE your pillows! Thanks so much for sharing! I just love your blog and so appreciate that you share your creative ideas and how-to's and and prices. I have some vintage embroidered pieces that I've been wanting to turn into pillows for my booth and once again, you've inspired me to get busy. Thank you, you are such a sweet person. Carol, these are really lovely! Thanks for sharing them with us! I here I thought I was the only one with my nose against my monitor trying to decipher price tags! Love the soap pillow (and the Graphics Fairy)! Lol second the gazing at price tags too hahaha. Those pillows look wonderful. Thanks for showing us how you make these!! These pillows are so pretty and dainty. I love how you used the flashlight, very resourceful! The pillows are beautiful and I appreciate the tutorial on how you made them. I have quite a few of those doilies somewhere in my craft room and I think I'm going to give this a try with some old family photos and make them for Christmas gifts! Thank you so much for popping by my Blog for a visit. I am so glad you got a chuckle out of my sick Granny funny photo! It really was gross but I could not resist posting it! These pillows are lovely and I am so glad you posted a tutorial on these since I have been wanting to learn how to do an image transfer onto fabric. Thank you SO much! I come over here and you are always doing something, you amaze me with the things you do Carol. YOur pillow are adorable, and thank you for the tutorial. I do appreciate all that you share with us very much, your a doll. LOL... with the looking for the price tag! Yet another beautiful and romantic offering from the polka dot closet! I need to get some of that temporary adhesive. That stuff sounds great. These are really, really beautiful! Carol that is a great idea and tutorial ! I'm with you on the price thing too. Than and I hate it when the price tags are turned over. Makes me think they are ashamed of the price...geeeeez if you're ashamed of what you have it priced at...lower it !!! I always have my price tags turned UP and I bet you do too. I just love your pillows. They are so pretty and what a great idea for doilies. I find that if I price pillows higher than $25. they won't sell, no matter how beautiful. People just don't seem to appreciate the beauty of something handmade. Your pricing is good and anyone would be crazy to pass those up at your prices! You asked about my soaps. I found a big box of pretty soap at a thrift store. It was all in ugly wrappers. I removed each soap and placed the bar in clear bags, added the stickers, ribbons and flowers and voile!!! I hope they sell. I need to find some more soaps because they are expensive when ordered on line. Sometimes you can find nice boxes of soaps at HomeGoods at a decent price. Very inspiring, such a beautiful idea you shared Carol, so delicate look the cushion have, absolutly impressive, I am also an admirer of pillows and cushions... I bookmark your this page and soon want to feature it on my blog, I ll let you know that when I feature it, thanks again a lot for sharing. Okay Carol, see this is why we all love and adore you! You give us beautiful tutorials and your honesty is so appreciated!! these gorgeous pillows have inspired me to make some of my own. I doubt they will be nearly as beautiful as yours! 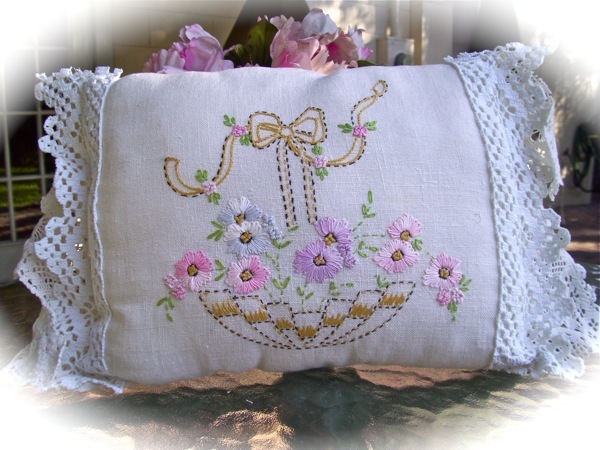 Thanks again dear friend for sharing the "how to" of these pillows! Just beautiful. Thinking of all the possibilities. Thanks so much for sharing your tips. I think I will have to stop and visit your booth when we come to FL next year and of course visit you! Another great and very pretty treasure! I've thought about making a pillow with doilies on it after seeing one at a store, but never thought of doing the image. Love that idea. If my sewing projects ever get completed (Ha!) I may have to borrow your idea for myself! Wow, that was a great how-to -- thank you! 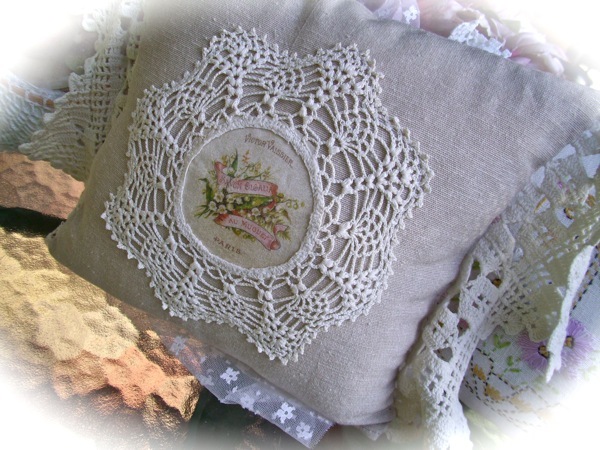 I, too, love to make pillows from beautiful old linens and doilies! I'm so glad you came by and commented on my blog so I could meet you! Carol your pillows are beautiful! I wish I lived closer because I sure would run right to your booth and purchase some pillows! Your prices are so reasonable! Hi Carol! I just found your blog through Deb (Garage Sale Gal). What on earth have I been missing?!!! First of all, I love the name of your blog. I love polka dots! Great name!! Second, one of my sisters is named Carol. Third, you're in Orlando?!!!! I'm in WPB!!!!! I was just in Orlando last weekend at the Mall at Millenia (I think that's the name). You have a shop? I have to visit! I love these pillows. I cannot believe you have had a kazillion visits since you started your blog in March! I can certainly see why. Now I need to go read other posts. I've only read this one on the pillows and I'm smitten! Hi Carol, I just adore these cushions! You are sooo clever! 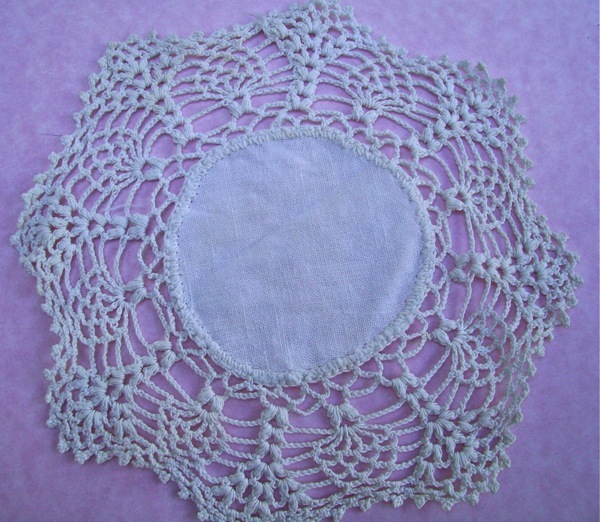 I have a lovely collection of old doilies, and I am never sure what to do with them, I just love them because they are old & there is so much work in them. Now I know what I can use them for - pretty cushions! Great idea, you are really talented Carol. Thanks for showing us how to do it too. Hugs n Blessings, Sue. You're amazingly creative Carol. 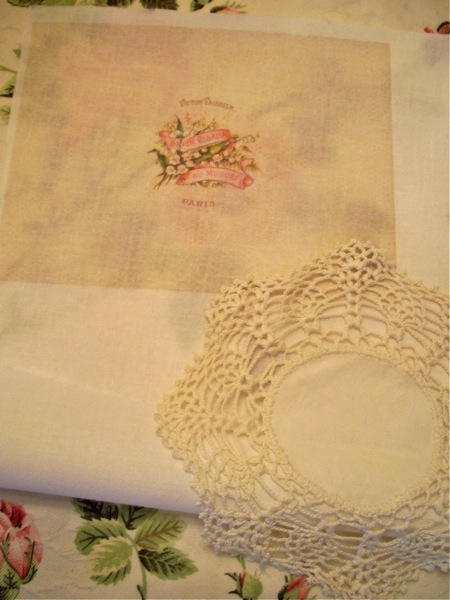 That doily with the graphics fairy print looks great all by itself! Thanks for inspiring! omg - i have been using that french graphic from the graphics fairy, too! so fun. your creations are always so cool & pretty. yes - i just got a tag punch. i might return it just because it punches 3 sizes at once and you really have to press hard (i even tried using my foot once!). i think a 1-tag punch would be the way to go and am guessing martha has the perfect one. a nice use for a michaels 50% off coupon! Carol they are just beautiful, I particularly like the one made with the table runner. Next time you make some let me know and I would love to buy one. Close inspection and all that so I can make some for my friends and family in Aussie. Thanks once again thanks for posting, I am glad your crafts came out of the Polka Dot Closet LOL. OH my, I love this idea! Thanks for sharing! Wow! 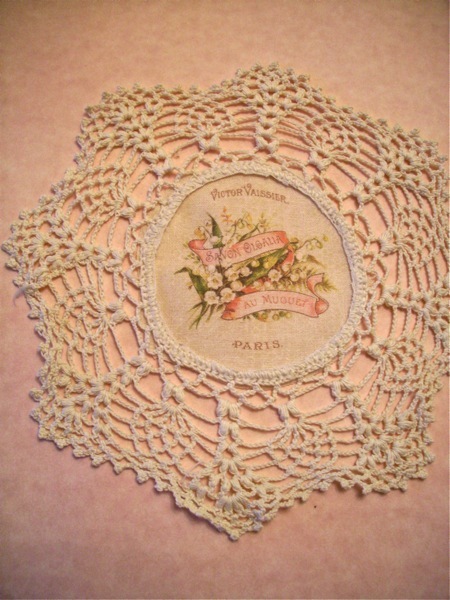 Very clever, now I can make use of some of these old doilies I have that are a bit shabby but I haven't the heart to toss out. I'm so glad I found your blog!!! Thank you! One of the things I love about your blog is that you always share your prices. BTW, I think they are great!